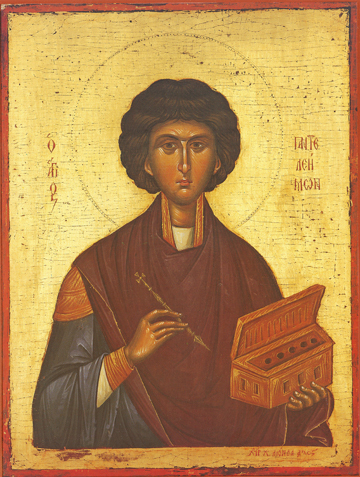 St. Panteleimon is one of the great healing Saints of the Church. He studied medicine as a young man, and was instructed and baptized into Christ by the holy priest Hermolaus. After baptism, St. Panteleimon began to heal others, not just by earthly medicine, but also by Divine Providence and Mercy. Jealous doctors denounced him to the Emperor Maximian as a Christian, before whom he freely confessed his faith, even healing a paralytic before the whole court of the Emperor. Unmoved by this, in a.d. 305 Maximian handed St. Panteleimon and his mentor St. Hermolaus over to torture with two other Christians, Hermippus and Hermocrates. The latter were beheaded, but the sword of the executioner broke over St. Panteleimon’s neck when it was his turn, while the saint prayed out loud. When he was done praying, he gave the executioner his permission, and St. Panteleimon went to the Lord joyously giving his head and life to Christ. The name Panteleimon in Greek means “all-merciful,” which he has proved himself over these many centuries by his great love, first to Christ, then to many of the faithful.